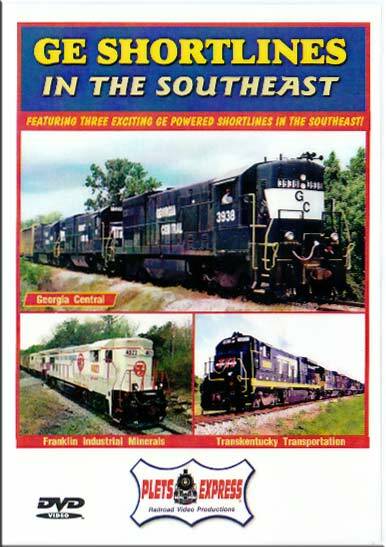 Featuring: Transkentucky Transportation Railroad, Georgia Central Railway, Franklin Industrial Minerals Railroad. The three GE powered shortlines are located in three southeastern states. See Transkentucky Transportation hauling long coal trains up the steep hills in Kentucky. TTI uses up to eight diesel lashup's including pusher units. Georgia Central freight trains are seen as they travel their rail line across the peach state going south of Macon, Georgia. The GC operates with a fleet of very rare highhood GE U23B's. In Tennessee, Franklin Industrial Minerals operates a 16 mile shortline from Rockwood to Crab Orchard, Tennessee. FIMX's very scenic and steep rail line includes a tunnel, tall trestles and bridges. That great GE sound and smoke are featured in this program with vintage diesel models: U28B, U36B, B36-7, B30-7, U23B, B23-7 & a GE 100 ton center cab. Chase Freeman (Grundy VA US) on 2017-05-08 13:21:23. This video is for sure one of the best in my library. You'll explore 3 rarely covered shortlines that use all GE power. If your a fan of older GE locomotives, you need this video! This is the first program I have purchased from Plets Express and it will be one of many. The camera work is superb.